I’m not sure what happened to the market on Friday particularly in the final 30 minutes of trading. A large number of stocks finished right on their lows, and many across a variety of sectors just below their 50 day moving averages. It was, of course, the final day of trading in a very profitable year and volume was light, but it was curious. It will likely be an interesting start to the New Year next week. 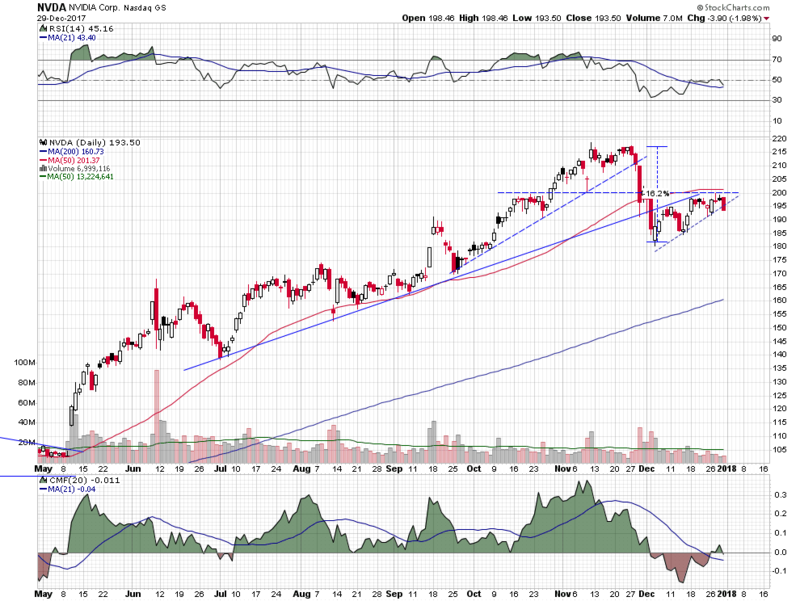 One stock worth watching next week is NVIDIA (NVDA), whose shares were powered higher this year by the company’s gaming graphics chips. Cryptocurrency miners also use these graphics cards to power their mining operations. Year-to-date, NIVIDIA has outperformed the S&P Technology Select Sector SPDR ETF (XLK) by over 35%, but it is under-performing the fund by 2.8% this month. 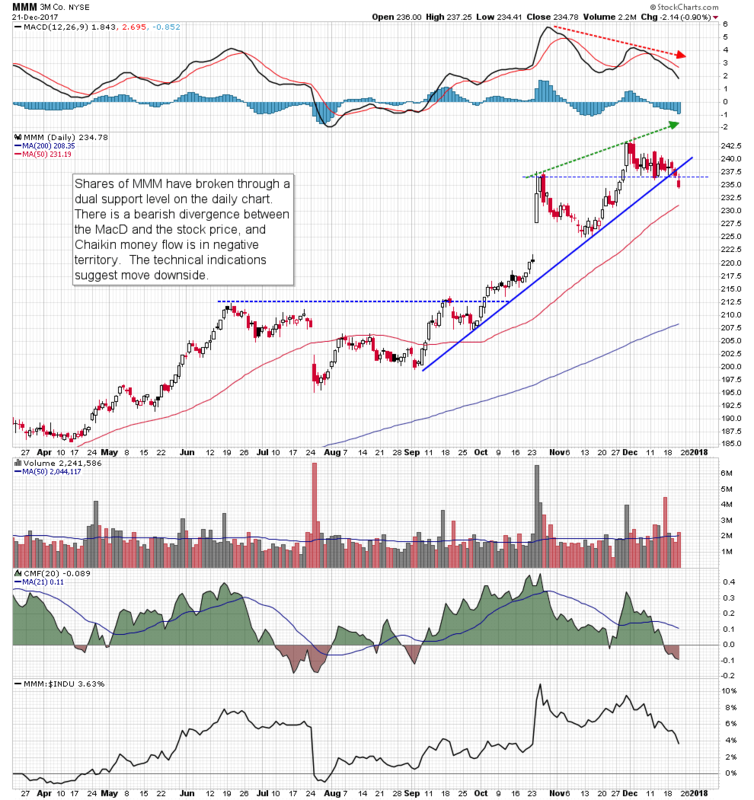 Shares of the semiconductor manufacturer dropped 16% in the last two session of November and the first two sessions of December, breaking through a six month uptrend line and the 50 day moving average. They have since made a small series of higher lows but under horizontal resistance in the $200 area. That resistance level has not even been penetrated on an intra-day basis. 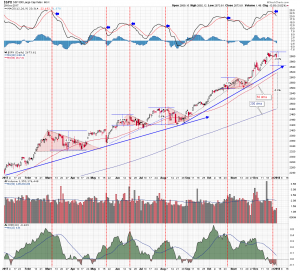 This lack of momentum has taken the relative strength index (RSI) lower and below its center line, and the Chaikin money flow indicator suggests that the stock has been under distribution. 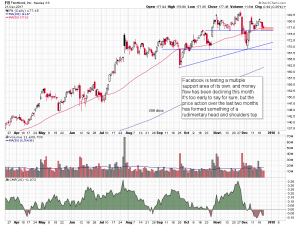 In Friday’s session shares closed on their low forming a large bearish dark candle that has cracked the short-term uptrend line drawn off the higher lows this month. The pattern on the daily chart of the early month drop in price, followed by consolidation resembles a bear flag, and further downside price action would confirm a pattern breakdown. 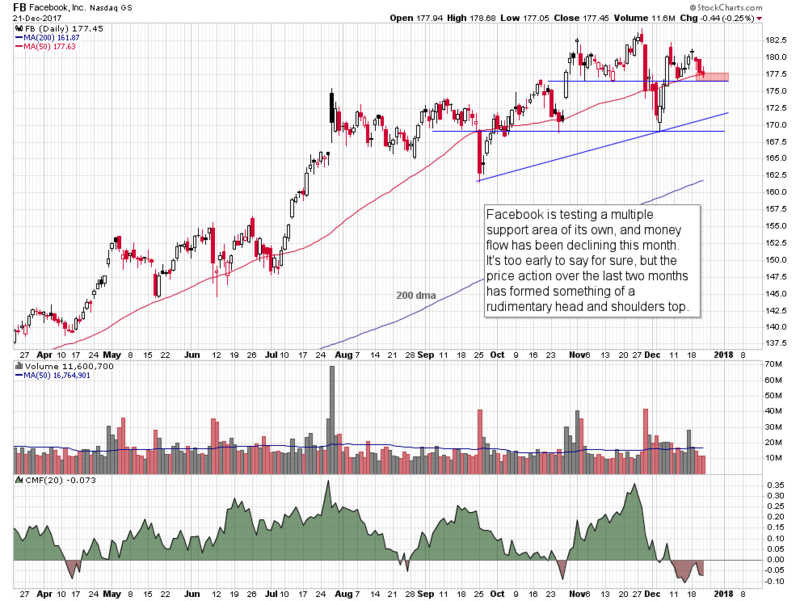 The measured move projected by the pattern targets a return to the current area of the rising 200 day moving average. NVIDIA has been a powerhouse stock and the primary trend is still higher, so a quick reversal and a break back above the $200 level, is also a distinct possibility next week. 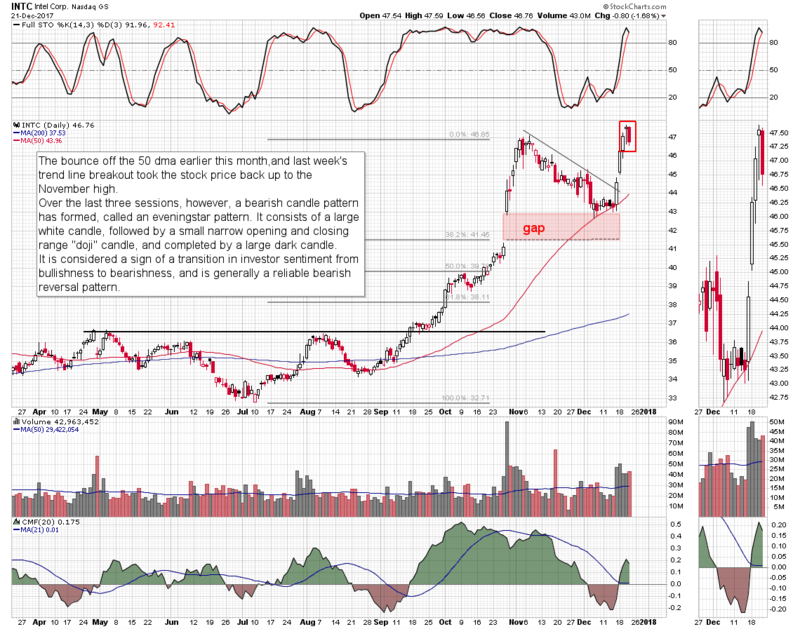 The potential for a new bull phase would be quickly bought and a new high for the stock would likely follow. The takeaway here is to be patient and let next week’s price action dictate the trade. Here is a year-to-date daily chart of the S&P 500 index. It is a thing of beauty. 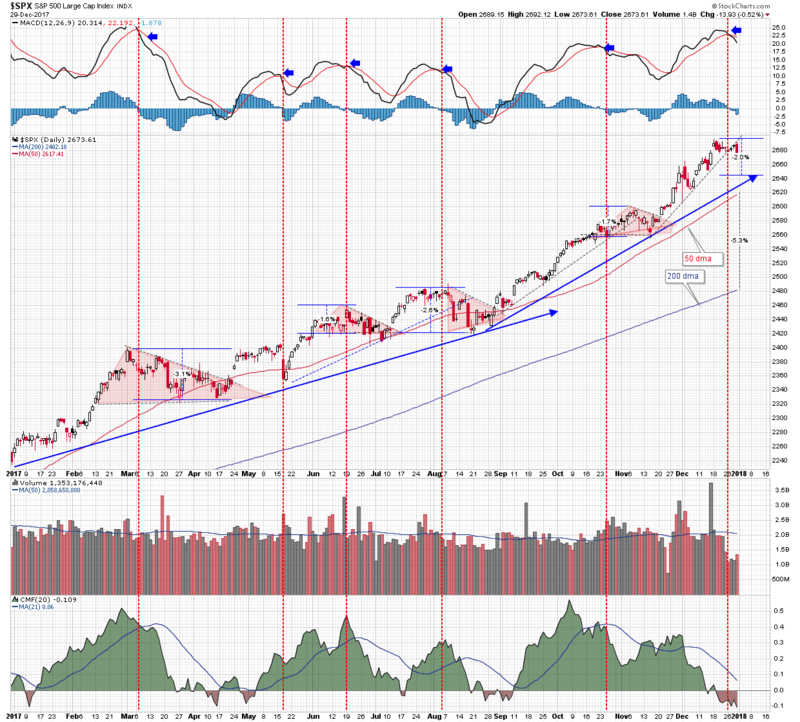 From January to August, the index oscillated in a very narrow range around its rising 50 day moving average, and under a well-defined uptrend line. In August, the upward momentum accelerated and price pulled away from the average, and formed a second and steeper uptrend line. This month, as in past periods, there are technical indications that the S&P 500 may be ready for a brief pause. This should not be considered bearish for the index, but rather as an opportunity to consolidate recent gains and prepare for the next leg higher. The 50 day moving average is currently about 5.3% higher than the 200 day average, which is the widest differential in over a year. This suggests the potential for some level of mean reversion. Moving average convergence/divergence (MacD) is making a bearish crossover and Chaikin money flow, a measure of buying interest, is in negative territory. There have been similar coordinated periods of waning momentum and declining money flow on this chart. In every case except the one in May, they have been accompanied by triangular price contractions, ending with breakouts to the upside and resumption of the primary trend. This week an interior up trend line was broken to the downside and, in Friday’s session the index closed on the low of the day. Volume, however, was very light during the holiday week. The technical indications are, once again, pointing towards another period of consolidation before the S&P continues higher. The question is: where will the index find support and build its next base? That’s not clear yet but the previous pullbacks have not been very deep on a percentage basis. A 2% pullback this time would retest the uptrend line drawn off the August and November lows, which would be a good place for a bounce. The path of volatility over the last two years, as represented by the iPath S&P 500 Short-Term Futures ETN, has been from the upper left hand corner of the chart to the lowest point on the lower right. Macroeconomic, social and political, national and global, and any other ancillary market concerns have been factored out of investor thinking, and fear has simply evaporated. It may be, however, investors are now coming to the realization that the market is not totally immune to an exogenous event. The action on the 30 minute chart over the last seven sessions shows the VXX trading in a narrow triangle pattern, below a declining resistance line and above horizontal support in the $27.40 area. It is currently retesting the triangle downtrend line and moving average convergence/divergence has made a bullish crossover and is above its centerline for the first time since the beginning of the month. Chaikin money flow has moved into positive territory suggesting some new buying interest and supporting the recent positive price action. A breakout above triangle resistance on the 30 minute intraday timeframe could be a catalyst for the improvement on longer time frames. One reason is a short-term floor may be in place and another has been the steady rise in positive money flow on the daily chart. At some point, investors will start to factor risk into this market, and the Volatility Index will reverse trend and start to rise. It is impossible to say with any certainty when that will happen, but when it does it will probably be a process that, in its early stages, looks similar to the one currently in progress on the charts. 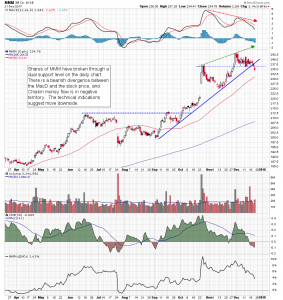 The current price action on the weekly chart of cybersecurity company NetScout Systems (NTCT), is similar to the price action that preceded the 2016 rally in the stock. There has been some basing action following a long decline, the stochastic oscillator has crossed out of an oversold condition, and Chaikin money flow has been moving steadily higher and is crossing into positive territory. These are the preliminary indications that were in place in early 2016 before the stock nearly doubled in price by early 2017. 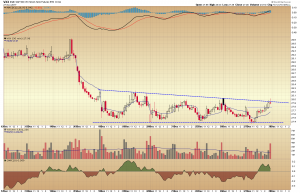 On the daily time frame the basing price action over the last several months has formed a cup and handle pattern. Rim line resistance at $32 is also the 38% Fibonacci retracement level of the 2017 pullback range. Stochastics are back above their centerline, and the recent strength in the stock has been reinforced by strong volume. A bullish breakout projects a pattern price objective measured by taking the depth of the “cup” and adding it to the rim line. 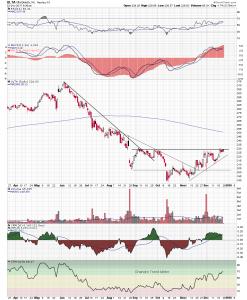 It targets the $35.50 area. 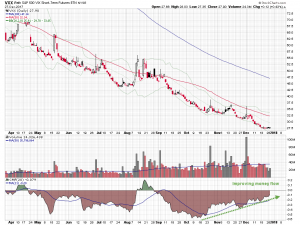 There is a 14% short interest in the stock and some covering of those positions could initiate more buying interest. Bitcoin – Declining Channel On Track To Test Lows? Two days ago an inverse head and shoulders pattern formed on the 30 minute Bitcoin chart, and it looked like a base had formed. 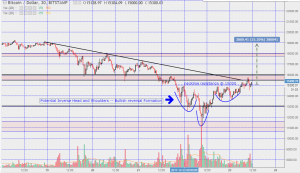 The bounce that followed took out the H&S neckline, but instead of gaining momentum and continuing higher, it met solid resistance in the 15500 area. 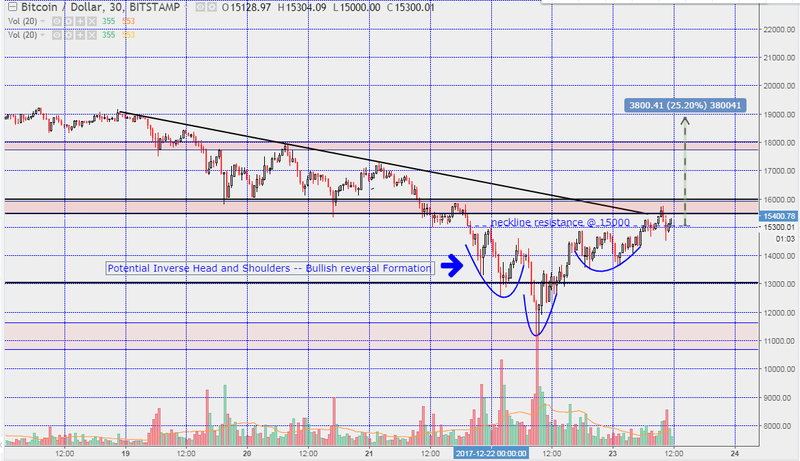 Subsequently, Bitcoin pulled back to the right shoulder support area. There was a brief bounce off the 13500 level, but that move faded and a low that was lower than the H&S right shoulder was made early this morning. A second small bounce followed the new low but it is currently being contained by the downtrend line drawn off today’s highs. The resulting pattern of failed new highs and lower lows looks like a classic downside stair step pattern. 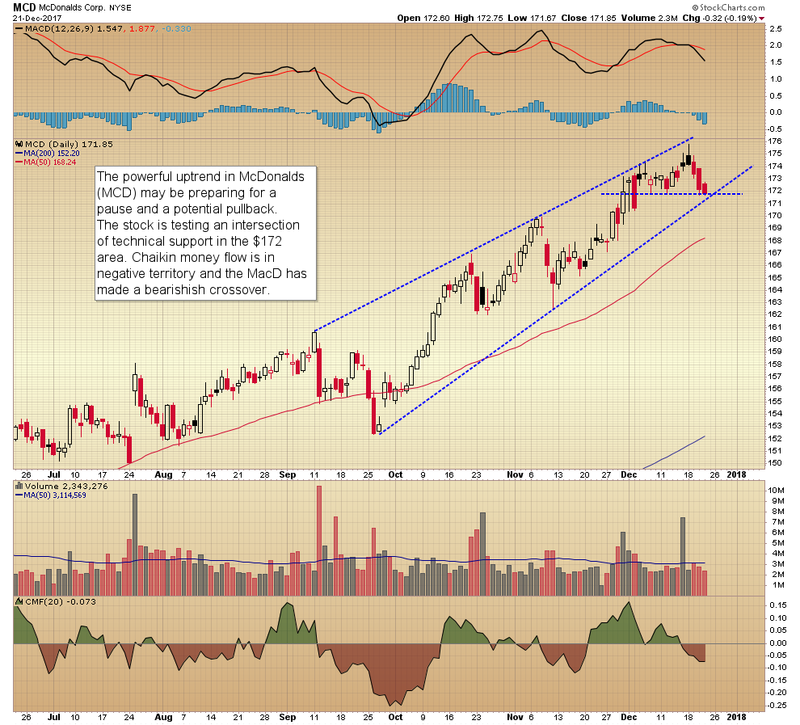 This pattern often forms a declining channel pattern. The pattern on the 30 minute Bitcoin chart will not be broken until its upper channel downtrend line is taken out, and there is another basing process. 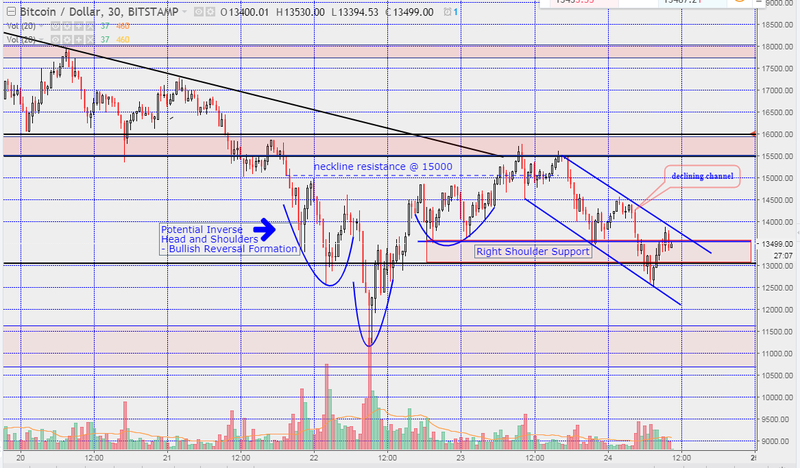 Recapturing the 15500 to 16000 resistance zone is key to a recovery. Unfortunately, for Bitcoin bulls the momentum is to the downside and several solid opportunities to reverse direction have been squandered. But it is Bitcoin and previous charting patterns can be quickly negated. An analysis of the 30 minute Bitcoin chart gives some insight into the recent “flash crash” and the support and resistance levels defined by the price action. The price of a Bitcoin dropped from over 19500 on 12/17 to the 16000 level on 12/21. This move was fairly regular and it looked like previous support in the 16000 to 15500 level was going to hold, forming a well-defined triangle pattern. But it did not hold and on the evening of 12/21 (UTC-5) momentum began accelerating to the downside. It wasn’t until the next morning that price stabilized in the 11000 area which, again, was prior support, this time on the daily time frame. Bitcoin buyers came in and the price started to move higher, back over 13000 and up to the 15000 area, which happens to be a 50% Fibonacci retracement level of the overall five day range. 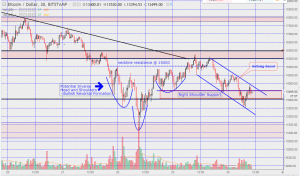 The basing process of the last two days has formed an inverse head and shoulders pattern on the 30 minute chart, with neckline resistance in the 15000 area. This pattern is a fairly reliable bullish reversal pattern often seen at important lows in price. Confirmation of the pattern requires several closes above the neckline and eventually a resumption of the former uptrend. 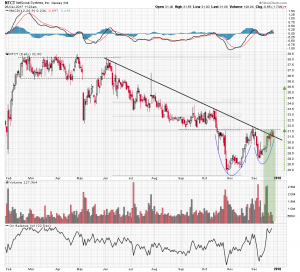 The inverse head and shoulders pattern can be used to project a potential upside price target. In this case, by taking the depth of the pattern (distance from the neckline to the bottom of the head) and adding that number to the neckline, the measured move higher targets a price objective in the 19000 area, or a 25% move from its current level. 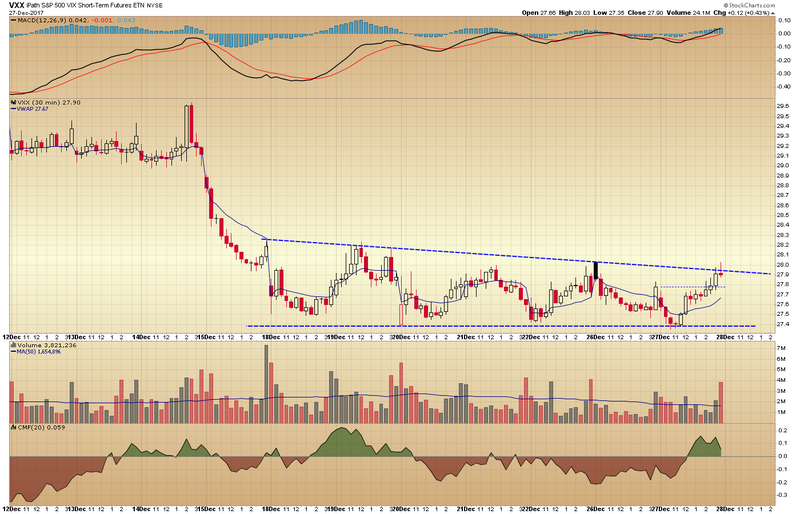 Again, confirmation of the breakout is required and the measured move is not a guarantee. This is trading after all, and trading of a very volatile instrument. A 25% move in Bitcoin is not headline grabbing but it would require several important levels of resistance to be broken and help to reestablish the uptrend. 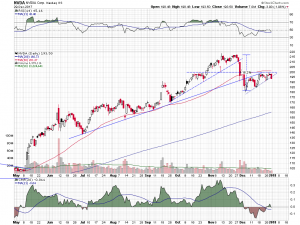 Shares of Ulta Beauty (ULTA) are attempting to form a base after their abrupt reversal in trend in June and the nearly 40% decline that followed. They ultimately found support above the $190 level in November and then began to reverse direction, moving back up to the $230 level. The price action over the last five months now looks like a rudimentary inverse head and shoulders pattern on the daily chart. 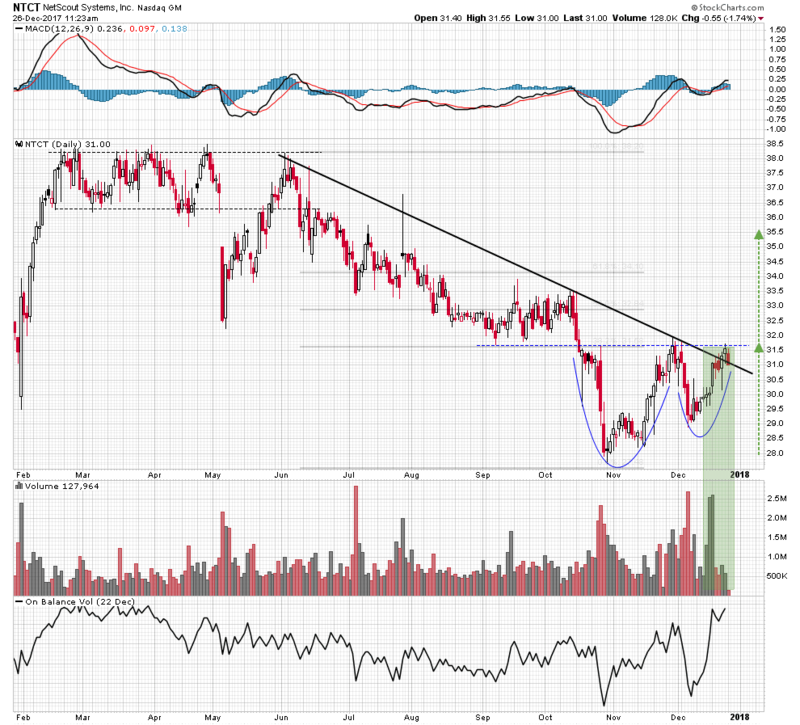 A inverse H&S pattern is considered a fairly reliable bullish reversal formation. The daily moving average convergence/divergence indicator is overlaid on a weekly histogram of the oscillator and is tracking higher and above its center line on both timeframes. 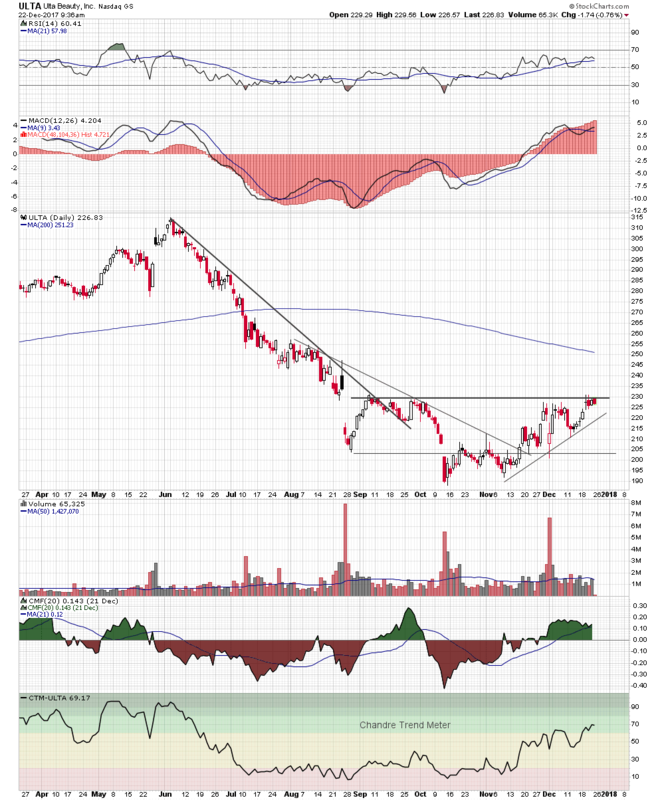 This reflects positive short term trend direction and momentum. Chaikin money flow moved into positive territory this month suggesting an increase in buyer interest. At the bottom of the chart is the Chandre Trend Meter, which assigns a number to a trend strength reading, measured by using six different moving averages on multiple timeframes. 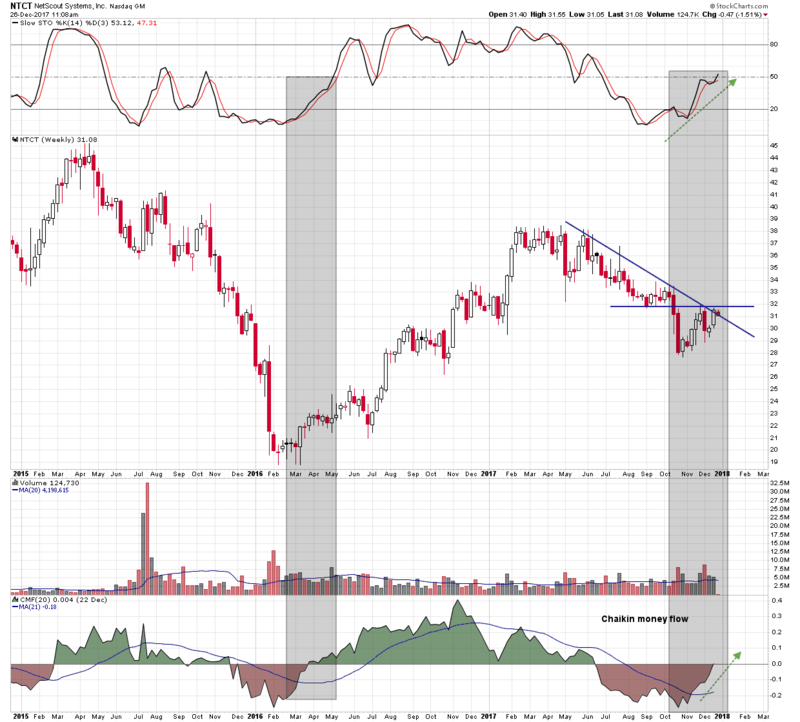 It is tracking higher and above its center line, another indication of improving trend strength. 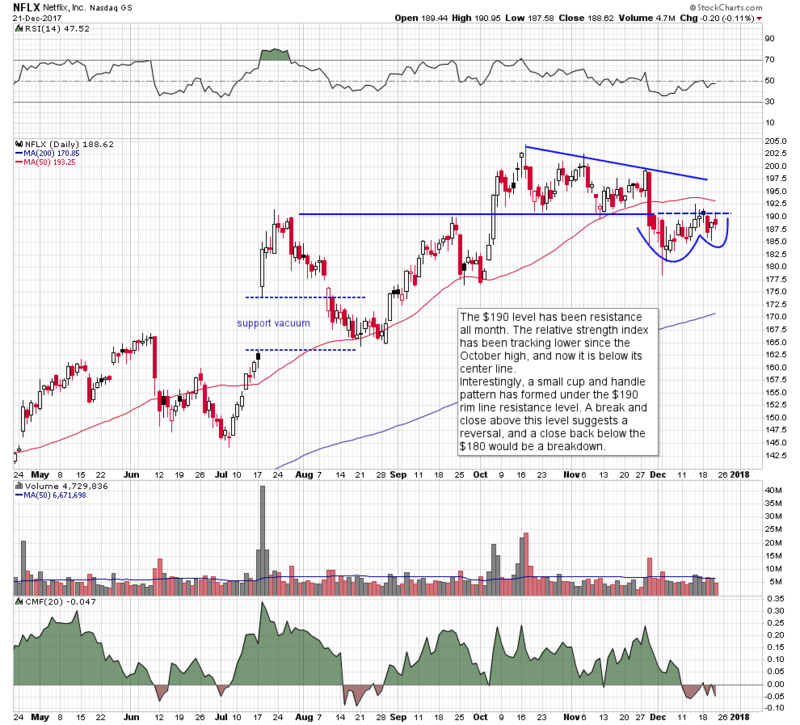 Several upper candle closes above neckline resistance in the $230 area could signal an intermediate term reversal in the direction of the stock price. 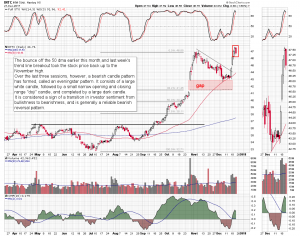 Here is a technical take on an interesting cross-section of five popular stocks. 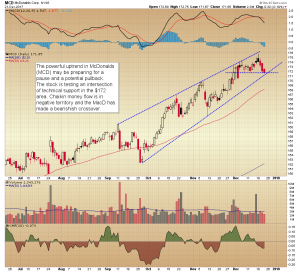 The integrity of their support levels could have a major impact on the direction of the broader market. 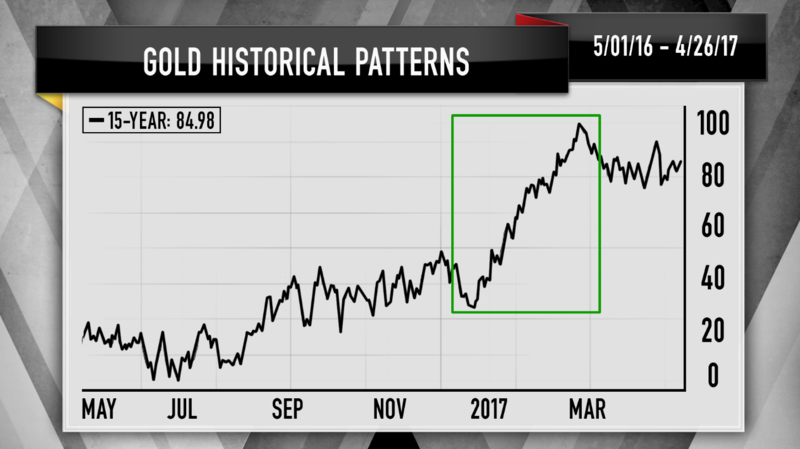 “Mad Money” host Jim Cramer took to the charts with technician Carley Garner to determine why gold can hold its own against bitcoin. Cramer: Why bitcoin is not replacing gold anytime soon from CNBC. With a Bank of America Merrill Lynch survey casting bitcoin as the world’s most crowded investment, CNBC’s Jim Cramer weighed the idea of the cryptocurrency replacing gold. To determine whether the idea has merit, Cramer called on technician Carley Garner, the co-founder of DeCarley Trading and the author of Higher Probability Commodity Trading. “Long story short, bitcoin’s not going to replace gold anytime soon, and I’d say that even if it hadn’t started pulling back over the past couple of days,” Cramer said. Garner began by saying that bitcoin was supposed to be an experimental currency that allowed people to anonymously move money around the internet, not an investment vehicle. The digital currency also isn’t backed by anything physical. If the internet shut down tomorrow, bitcoin owners wouldn’t be able to access their assets. A bitcoin owner being hacked or forgetting his password would garner the same result. “Put it all together and Garner believes bitcoin’s astronomical value is the result of perception, not reality,” the “Mad Money” host said. Gold, on the other hand, has some inherent value. Even though most of its value is symbolic, the precious, non-corrosive metal can still be used to make jewelry, conduct electricity or cap teeth. Plus, the $2.4 trillion global gold market is very deep. Millions of investors own a piece of the pie in the form of bullions, jewelry, coins or other investments. In comparison, the entire digital currency market is worth $600 billion, with bitcoin only accounting for about half. As such, Garner was skeptical that gold is falling because bitcoin is soaring. Gold pulled back below $1,250 an ounce four times this year and managed to bounce back, and no one blamed the declines on bitcoin, she said. 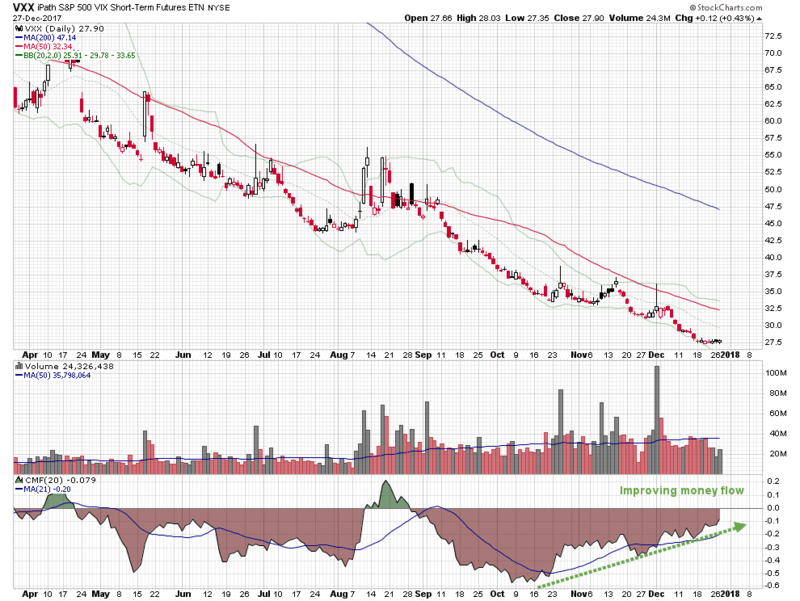 Moreover, gold’s charts suggest its value could go higher. 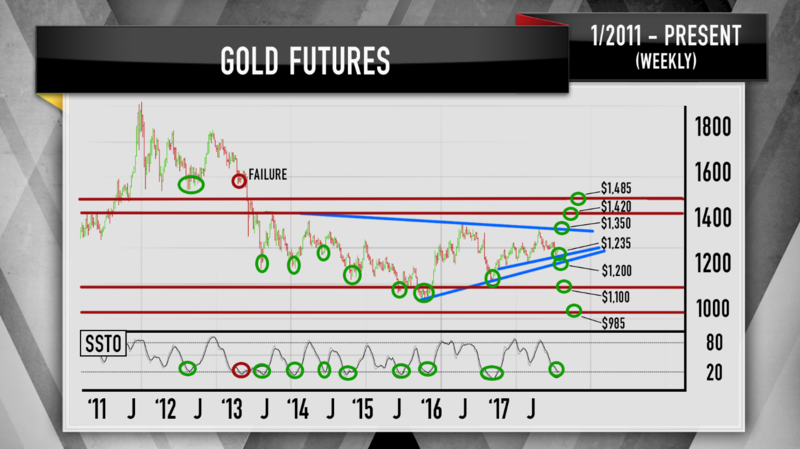 Historically, gold tends to decline in early December, then buyers come in and drive the precious metal to rally until March. 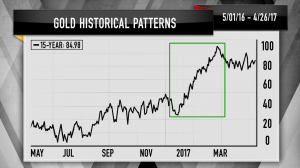 “If that seasonal pattern holds up, Garner says you should be buying the dips in gold, not freaking out about its relationship to cryptocurrencies,” Cramer said. 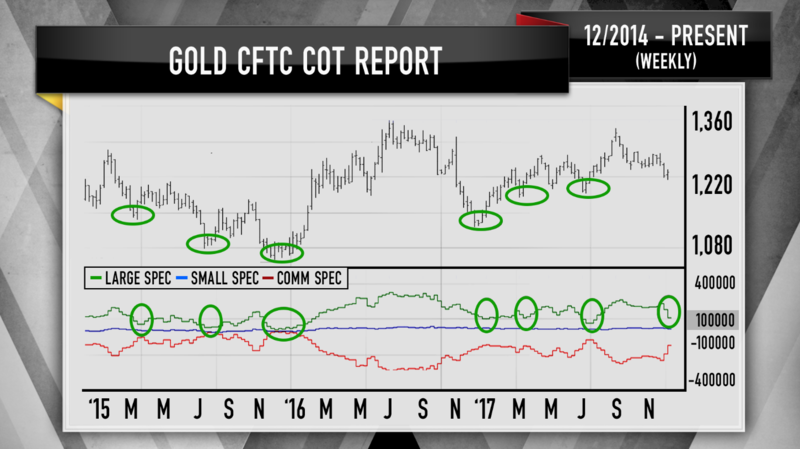 Better yet, the Commodity Futures Trading Commission’s Commitments of Traders Report in gold’s weekly chart showed Garner that gold could be at or near a bottom. Covering all her bases, Garner also looked at the weekly chart of the dollar index, which tracks the U.S. dollar against a group of foreign currencies. 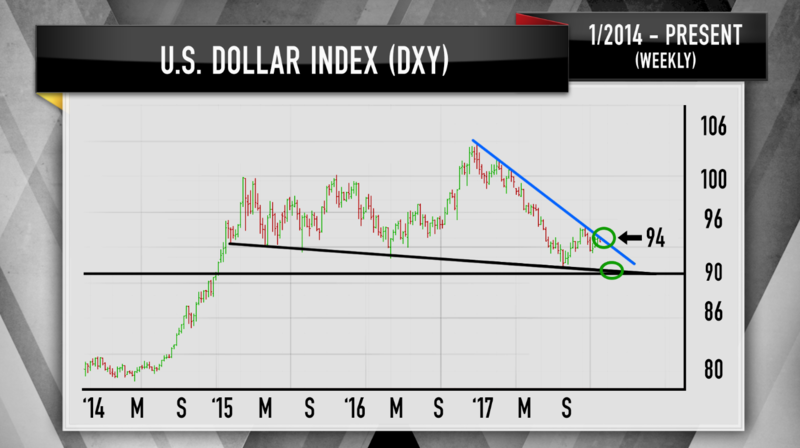 When the dollar goes down, gold goes up, and the dollar is on a downtrend, which means gold could have more strength ahead. Finally, Garner noted that the stochastic oscillator, which measures when assets are overbought or oversold, is signaling oversold readings in gold’s weekly chart. 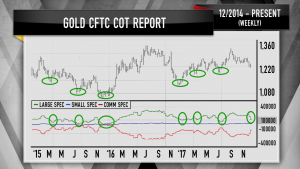 “Of the last 10 occasions when this oscillator has shown oversold readings — meaning gold’s due for a bounce — nine of them have ended up giving you a nice rally,” Cramer said. Garner also noticed two solid floors of support for gold at $1,235 and $1,200. 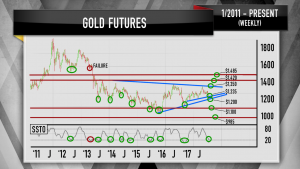 All in all, she expects the precious metal to run to $1,350 before finding any kind of ceiling of resistance, with the possibility for gold to reach the $1,400s if some global calamity occurs.